The Dawn of the Laptop Era? A new Apple Knowledge Base article outlines some easy steps to prolong the charge of your Apple iBook or PowerBook battery. Choose Battery Power from the "Settings for" popup menu. Choose Longest Battery Life from the Optimize Energy Settings popup menu. These settings will put the hard disk to sleep whenever possible and reduce the computer's microprocessor performance in order to maximize its battery life. If you are using processor-intensive applications, you may wish to change these settings so the microprocessor performance is no longer reduced. Set your screen brightness to the lowest comfortable level. Press the F1 (dimmer) and F2 (brighter) keys to dim the screen until the brightness is as low as possible and the screen is still comfortable to look at. Eject CDs and DVDs you're no longer using. Every so often, the optical drive spins up to read CDs or DVDs. This consumes a small amount of power. Disconnect peripherals when you're not using them. Connected peripherals, such as printers and digital cameras, can draw power from your battery even when you're not using them. If you're not in a location where need to use AirPort or Bluetooth, you can turn them off to save power. Choose Network Port Configurations from the Show popup menu. Trans Intl. has announced worldwide availability of a 2 GB DDR266 (Double Data Rate) memory upgrade for the iMac G4 17" flat panel model, which expands the system's main memory up to 2 GB. Trans Intl's 2 GB memory upgrade consists of a 1 GB DDR memory module for the user slot and a 1 GB DDR memory module for the factory slot. The 17" 1 GHz iMac has two memory expansion slots for main memory expansion. Trans Intl's memory upgrade doubles the memory density of the expansion slots [user and factory] to 1 GB. Before the Trans Intl. upgrade, each expansion slot of the 17" iMac was limited to only 512 MB each. Trans Intl. memory modules conform to Apple's stringent electrical and mechanical design guide lines. The 1 GB DDR266 memory module operates at a clock rate of 133 MHz and transmits data at 266 Mbps. TransIntl also recently introduced 1 GB Memory Modules for 17" and 12" PowerBooks. Willow's new Kemano 17" PowerBook Carry Case has been specifically designed to maximize the protection of the 17" PowerBook and to compactly carry the accessories that are a part of your working system - all in a stylish, clean looking parcel. Clean, flexible, and extremely protective design at a reasonable weight. Excellent protection for 17" PowerBook afforded by 1.2 cm (0.5") foam reinforced by corrugated plastic on the back, high density polyethylene reinforcement on the handle side, and 4 mm (1/8") hardboard on the bottom. Extra protection for the upper 17" screen provided by an outer foam padded pocket plus inner soft foam corner spacers to isolate the PowerBook from outer shocks. Exterior 600 denier polyester and interior 200 denier nylon, both of which are urethane coated for waterproofedness. The fabrics give an excellent balance between superb protection and durability and light weight. Convenient DVD, CD-ROM, and cable pockets located in the laptop section for easy access, plus extra room for manuals or other letter sized paperwork on lower accessory level. Simple outer front organizer panel with pockets business cards, pens, pencils, etc. Flat external rear pocket especially handy for maps, magazines, or newspapers. Easily removable horizontal divider for the 17" PowerBook that doubles as a comfortable and convenient laptop work surface with special foam spacer to maximize airflow cooling. Extra protection for the display screen afforded by corrugated plastic layer and extra 1.2 cm (1/2") protective space between the PowerBook and laptop lid level. Three separate velcroed elastic straps to lockdown 17" PowerBook, adapter, accessories, and extra items. Handy mesh pocket in lid for safe and convenient storage of cables or other thin items. Luggage feet riveted through the hardboard bottom of the case which actually keep it up and off the ground when you want to set the case down. Shinza.com has announced the immediate availability of the ZeroShock line of notebook sleeves and mobile accessory cases. The ZeroShock line of notebook sleeves and mobile accessory cases are composed of a high-resistance polyurethane foam that provides superior absorption of external impact force. By compressing slowly and expanding slowly, high-resistance polyurethane is particularly adept at absorbing impact energy. Due to these properties, this material is most often used in medical devices, car seats, acoustic devices, and aerospace development applications. 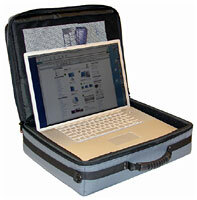 Applying this technology to notebook cases results in an unparalleled shock-absorption/weight ratio. Translation? Better protection for digital devices with less weight to lug around. Available in blue, red, black, and grey, the new ZeroShock 12" Notebook Sleeves are perfect for small laptops. Innovative designs have a way of complementing each other, and thus this sleeve is a particularly good match with the 12" versions of Apple's PowerBook G4 and iBook notebook computers. The ZeroShock 15" Notebook Sleeves are designed for larger notebooks with 14" and 15" displays and are available in blue, black, and grey. Designed to protect digital cameras, portable music players, PDAs, and other mobile digital devices, the ZeroShock Mobile Accessory Case is available in three different sizes and two colors (black and grey). The ZeroShock 12" Notebook Sleeve, 15" Notebook Sleeve, and Mobile Accessory Case are available now at Shinza.com for $24.95, $26.95, and $14.95, respectively (US). Sonnet Technologies has announced the new Aria Extreme, a CardBus wireless network adapter that provides 802.11g wireless networking for certain PowerBooks and Windows notebooks. The Aria Extreme installs into any CardBus slot and instantly adds wireless connectivity with data transfer speeds up to 54 Mbps, nearly five times faster than the previous 802.11b standard. The Aria Extreme is compatible with Apple's Airport Extreme Base Station as well as other 802.11g base stations. It is also backwards-compatible with previous 802.11b WiFi network devices, and supports both 64-bit and 128-bit Wired Equivalent Privacy (WEP) encryption. The Aria extreme for CardBus has an MSRP of $79.95 and will be available mid-September 2003. "During the summer, Apple became one of the coolest companies in America. At least that's what youth marketing experts who follow the tastes of teenagers say. "Asked recently what company they would most like to endorse (if they were a celebrity), [Look-Look poll] correspondents nominated Apple the most popular choice, followed by Coca-Cola, Levi's and Nike." However, there's a downside to being the "cool" computer company. One analyst quoted by Kahney notes that: "There will always be a correlation between a product's coolness and niche market share. By definition, being cool is the opposite of being mainstream, and as long as a brand has a cool cachet, it will remain small." "Once considered poor choices for serious computing, notebooks are earning new respect from hard-core fans of desktop PCs. "Why the change of heart? Today's notebooks offer powerful processors, dazzling large LCD screens, improved upgradability, and features as potent as those you'd get on many desktops - all at attractive prices. Couple that with the siren song of ubiquitous wireless connectivity, and more buyers are seriously considering a notebook for their next business or home PC. "This spring, according to NPD Group, retailers for the first time made more money selling laptops than desktops: Portables accounted for 54 percent of May's nearly $500 million in PC sales . . . in 1999 one in ten home computer buys worldwide was a laptop, these days it's one in five...."
"Strong notebook sales have hit monitor manufacturers, who have seen less-than-expected market growth in the second quarter 2003. "Demand for 15-inch screens &endash; as used in many notebooks &endash; has also exceeded supply, as manufacturers move production to more profitable larger-sized screens ." Hmmm, wonder if that's part of what's holding up the release of Apple's new 15" replacement for the TiBook? MacZone has one open-box return 12" iBook 900 Combo available for $999.97. Look for item number 00184125.